Lawn care aftercare advice. What to do and when. At Total Lawn Care, we often get asked what we are doing and why. Here is some aftercare advice to help guide you through the lawn care year. After scarifying. In the case that the weather turns dry and hot, after scarifying, then we recommend that the lawns are watered. at least once if not twice a week, just to help the grass recover from the scarification process. The recovery of a scarified lawn can take around 10 weeks, or longer if no water is applied in times of drought. Weed Treatment on lawns. We kindly ask that you refrain from cutting the grass 5 days before and 5 days after the lawns are treated with our weed killer. Also it is recommended that the grass clippings are not composted for the following 3 grass cuts. (Please note that the weeds can take up to as many as 4 weeks before they are dead and even longer for them to wither away.) Shortly after the weed treatment has been administered it is normal to see the weeds grow at a faster rate, this is due to the weeds trying to defend against the chemicals. For this reason many people assume that the treatment has not worked. Please allow 3-4 weeks for the weeds to die off. Dont worry if we have missed a patch, as we will be checking each lawn when we visit at the end of the summer for step 4 in our 5 step perfect lawn plan. Grass cutting. Dont be tempted to wait 2 weeks between cuts, then cut the grass very short. All that you will do is stress the grass and promote it to grow even faster. It is better practice to cut weekly and to leave the grass at around 1 and a half to 2 inches in length (3.5 to 5 cm). In times of drought, we advise that you raise the hight of the mower to allow the grass to grow longer. This will help the grass to stay green for longer. If in doubt ask a member of our team. Watering just once a week can be enough to stop the grass browning off. But if it does turn brown, don’t worry, as it will always come back. (However, this will promote thatch in the lawn and could also invite diseases like Red Thread .) 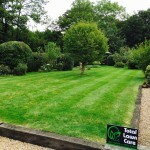 We can help get your lawn back with a specially blended lawn feed, and plenty of water. If you have any other questions, or need advice, then please contact us.